See below for a selection of articles and videos featuring U.R. Our Hope and our families online, in print, on TV, and on radio/podcast. U.R. Our Hope was featured in the Tarrytown neighborhood newsletter after our visit to the local Fire Department. The 24-pound girl is confined to a wheelchair because she can’t stand, sit or do anything by herself. She can’t even eat on her own. Vanessa Garcia, Joseph Vaughan and their son Braxton were on KXAN News at Noon in February and demonstrated how they feed Braxton through a tube — not knowing then what was wrong with him. However, a new diagnosis has given them some direction and hope in caring for Braxton. Sister Aileen and Pediatric Physical Therapists Dr. Parker, who has been working with the family, also joined. One of the most moving moments (and there were many of them) at Global Genes’ recent patient advocacy summit was when Heather Long, founder of the Texas-based nonprofit U. R. Our Hope, rose to tell the audience why she felt that diagnosis was such a critical issue for the rare disease community. Long and her husband, Cody, have three children; two daughters and a son who passed away in 2006 at the age of 5. They know that they have lost their son. What they don’t know is why. Most rare disease patients spend a good portion of their lives coping with a condition that is either undiagnosed or misdiagnosed. Some of them die of a disease that has yet to be named. Heather Long’s son, Cal, was one of them. After years of searching for answers, she lost her son at the age of 5 to a disease that had never been diagnosed. Since then, she has made it her life’s work to help others caught in this heartbreaking situation. There is an undiscussed epidemic happening in our country, and around the world: rare disease. Rare diseases are incredibly hard to advocate for, despite the fact that they affect so many people. Precisely because they are rare, it’s hard for companies to make money off them, doctors to educate themselves about them, and patients to advocate for them. 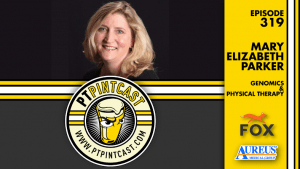 We talked to Mary Elizabeth Parker about the role of Genomics and Physical Therapy while at the NEXT conference in 2018 in Orlando. In past shows, I have had guests who related their heartbreak and struggle to find a diagnosis for a child or loved one. The journey is perilous, arduous and all consuming. For some, it can take years while others watch their loved one decline with no treatment or cure insight. This show will feature families who searched and fought the healthcare system and were able to get answers. Then comes the work of treatment and long term care. I am looking forward to the insight of these families and how they were able to successfully navigate the healthcare. There stories will inspire all of us.